Online meetings are an important aspect of doing business today and helps businesses connect effectively with their clients, partners, suppliers, associates and employees on a regular basis. Online meetings have reduced the need of physical meetings and allowed multiple people to join in from anywhere in the world in real-time. Virtual meeting rooms have saved countless millions for global businesses due to their convenience and continue to do so today. Web conferencing software was developed to better connect people when remotely or disparately located. It is integral that you choose a virtual meeting and conference solutions provider that gives you the best quality at the most reasonable prices. You can use our meeting clients to setup instant or scheduled meetings with one click, enable participants to join in from any mobile, tablet, desktop, H.323/SIP room systems, telephone and Zoom Rooms. Our communication system helps organizations cut down on data and resource usage and get the best professional meeting performance from the latest and leading codecs. Using Holistic’s online meeting and video conferencing applications simplifies the privacy and security of your professional communications. We realize how crucial it is for you to protect your confidential data and make sure that it is not accessed and misused by unauthorized external parties. Our meeting rooms are designed to provide the highest level of security for our clients, so you can collaborate and get your ideas across securely. We provide multiple levels of security that helps clients restrict access and control to your documents and prevent unauthorized screen captures with watermarking. You can configure your watermark display for sharing content securely with any number of participants. Connect, communicate and collaborate with ease, without ever worrying about the security of your data with Holistic’s meeting and video conference solutions. Holistic online meeting and video web conferencing solutions have been designed with a high priority on the security of our clients’ professional interactions. We provide security features such as work email, single sign-on (SSO) or Google login, Secure Socket Layer (SSL) encryption, password protection, AES 128-bits encryption, HTTPS access, role based access control and advanced admin controls. We secure every aspect, right from your communications, to meeting rooms and room connectors and provide quite a few control features for admins and business owners. 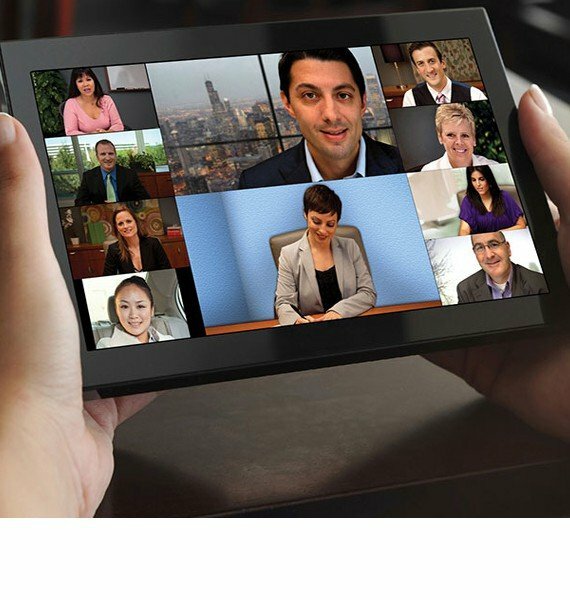 Our online meeting solutions encrypt everything from the network connection to our meeting rooms, to your company’s internal network connection, to screen sharing content and presentation content. We have designed our solutions to keep all real-time meeting traffic, including audio, video, and data sharing stays within your company’s internal network. We assure AES 128-bits SSL (Secure Socket Layer) end-to-end encryption for all connections to your business communications. Business meetings often involve various groups including employees, associates, partners and service providers simultaneously. This raises the need for the ability to customize permissions of participants, including file and screen sharing viewing access, private conversations (during conference calls), muting, adding or deleting participants and other specific functions. We offer a wide range of meeting control feature for admins that enable locking meetings, pausing recordings for specific participants, adding new admins, joining before and after host meeting, special invitations and more. Our web meeting client gives you total control over your business communications and getting a detailed overview of all activities in real-time. With an IT-Dashboard for all to use on the business plan for web conferencing and virtual meetings. All meeting participants need to confirm their identities by using uniquely generated session tokens to sign in, for security reasons. This gives our clients total freedom to allow IT managers to define which groups of people who use virtual web meetings get which assigned privileges. Holistic’s professional collaboration solutions enable completely secure online meetings for businesses. To find out more about web conferencing software and virtual online meetings, contact an Holistic Communications professional today.